The Chicco Red Bullet Balance bike is one of the best budget balance bikes available, with the bike generally available for just over £30 from new. This makes it one of the cheapest bikes on the market - so is it worth the investment and what do you get for your money? The bike has a metal frame, and weighs in at a very light 2.7kg, although one of the reasons for the low weight is that the bike is small compared to other models. This means that although the bike is marketed for children that are 3 years or older, you will probably find that most 2 years olds will be able to comfortably use the bike, and by the time they reach 4 or 5 they will have outgrown it. The metallic frame is painted a striking red colour on the Chicco Red Bullet Balance Bike, and features includes an adjustable seat with a lowest seat height of 33cm. This means that the bike looks great and little riders will love learning to ride on a 'proper' bike rather than a toy. The saddle height is probably the most important factor to consider when choosing the best balance bike. The height of 33cm on this bike is ideal for most 2 year olds which is one of the reasons this bike is one of our recommended balance bikes for 2 year olds. However, please make sure that you measure the inseam of your child first to make sure the minimum saddle height is around 2.5cm – 3cm less than their inside leg. The handlebars are also adjustable, and the bike comes equipped with plastic tyres so it can be used as a toy inside the house or outside when you go to the park. This is a common feature on some of the less expensive balance bikes, as they are low maintenance and puncture proof. Read more about balance bike tyres in our Ultimate Balance Bikes Tyre Guide. The bike does require some assembly, although this is quite straightforward and should not take more than a few minutes as most of the work has been done for you before delivery. 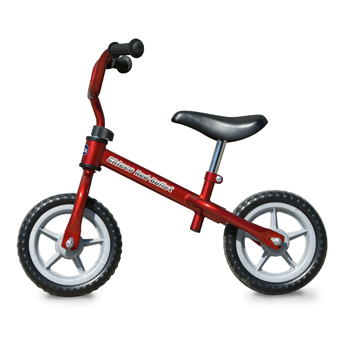 The Chicco Red Bullet Balance bike is one of the best value balance bikes around, and although it is not packed with many features it does have a sturdy and durable build and provides the basic requirements for a good quality bike. The thin chassis, light weight and plastic tyres make it a good choice, although the very short wheel base can make the bike difficult to handle and it can show signs of wear and tear after heavy use.